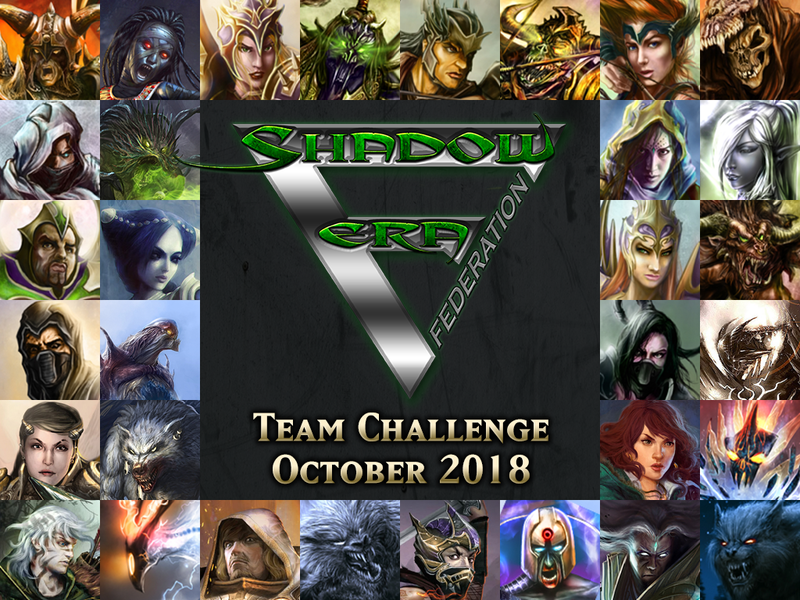 The SEF Team Challenge came back with a vengeance in SEFtember, with the best performing heroes from previous months being paired together and the weakest from those months being paired together. We have no clue what Vull was thinking, but he's now gone for the complete opposite - best teams split up and paired with those from the worst teams and so on. Due to popular demand, we have retained the boosted prizes for over-achievers and MVPs from SEFtember. The Shadow Era Federation is intended to be a fun way to enhance the core Shadow Era experience, through new challenges, rewards and significance placed on Rated Multiplayer results, whilst also boosting player engagement and entertainment when you aren't able to battle. 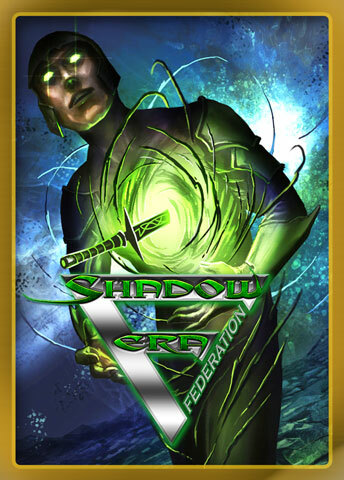 We will be achieving this through a brand new tangential storyline involving Vull the Insatiable , the ruler of the Shadow world of Phaed, who has managed to capture all 32 of our heroes on Phaed and has forced them into competing against each other in various events within what will surely be his biggest ratings winner of all time, the Shadow Era Federation. Vull is not ashamed to admit it has not been an easy task to assemble and contain all 16 Human heroes and 16 Shadow heroes, but he has addressed this in an ingenious way through initially dividing each faction into its smallest unit and then weaving them together to make 16 Human/Shadow teams that will take part in the SEF Team Challenge. 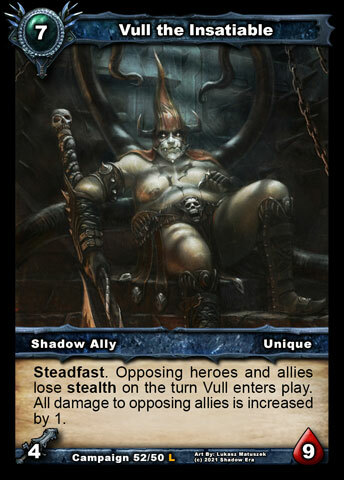 Whether between teams or within teams, the expected scale of conflict is certain to keep every hero distracted from unifying against their captor! We have really enjoyed seeing this story unfold so far, with the players at the heart of where it goes. * if they are in a "mirror match”, where both heroes are the same, it will show how close that hero is to their breaking point. The statistics from these matches will act as the foundation for the original storylines within the SEF that will be told in a variety of ways, from short stories and articles to videos. 1) Each rated multiplayer match you win with a hero will count as a win for their team, regardless of the opponent (since you can’t choose who you face). 2) Once per team, when you achieve 5 wins with them, you will earn 10 SC, meaning 160 SC can be won during the month (along with your usual 80gold and 400XP for a win). You will be able to view your progress with each team on your Status screen. I'm in the process of sending prizes for October SEF Team Challenge at the moment, but it's only semi-automated process so that all the updates to accounts can be reviewed before being actioned! There was never enough time to put together, test and verify a fully trusted system to do everything for me. For those asking about SEF in November, I'm afraid there isn't one and, at the current time, it is not known if there will be any more SEF Team Challenges in future. 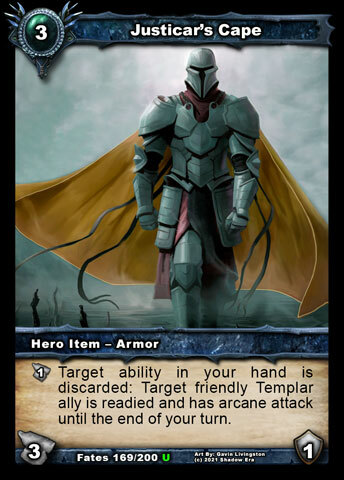 I hope everyone enjoyed taking part in these special monthly events during 2018, playing a wide variety of heroes and all the great prizes on offer. It was good while it lasted and too bad it won't continue but I understand why. It was a fun set of events. Hopefully it can be brought back periodically to celebrate the completion of LL or other noteworthy events in SE!